The idea isn’t new. It was a mantra I learnt more than a decade ago during the internet boom or ‘dotcom’ era. I suppose it is equally applicable now, especially in an exciting time when the possibilities in our lives are simply limited by our imagination. It’s interesting how this ‘wisdom’ from my days in management consulting is creeping back into my current work in executive coaching and leadership development. I have seen so many intelligent, gifted and talented professionals losing their spark and their capacity to dream, particularly after a decade or two of conditioning in the ‘real’ corporate world. They were told to ‘get real’ and ‘stop dreaming.’ Early failures taught them to play safe and take the more secure or steady route, rather than the road less travelled. Disappointments, disillusionment, and dismay typically follow. Gradually, work becomes less exciting, less meaningful, less fulfilling, albeit financially rewarding (for some). That’s both sad and ironic, given that an average adult spends the majority of his or her wakeful hours at work. Son, I hope you never get to that state, or if you do, remind yourself to dare to dream again. 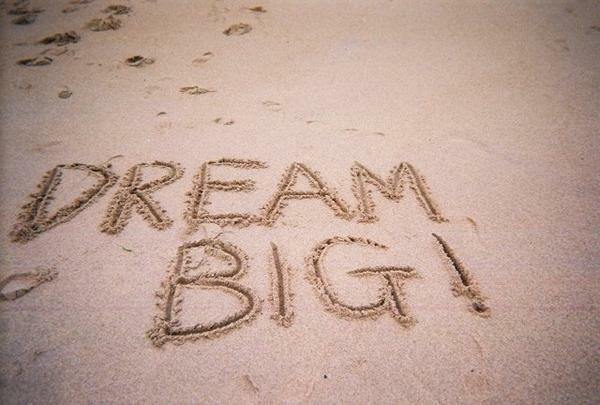 Yes, dream big, really BIG … let your imaginations run wild, indulge in your creativity for a moment, give yourself permission to PLAY with any idea that emerges. What would you dream of accomplishing, doing, being, becoming, having, conquering, creating, experiencing, if you know you can’t fail? Ignore the obstacles or constraints for the moment (they are real, but not useful in the act dreaming). What would your dreams be … write it down. Dream Big. Start Small. Keep Going.